1. Did some greek chicken the other night. I decided to chop a few tomatoes and mix in some balsamic vinegar and some herbs, then serve it on top of the chicken. It was INCREDIBLE. Not only was it easy and delicious, it also was a very pretty addition to the plate. I will get pics next time. I’m so sad tomato season is coming to a close. 2. Made mashed potatoes last night, and I make EPIC mashed potatoes. This time however, I made them even more epic by sprinkling my favorite spice…. SUMAC on top of them.. Again, super easy tasty and pretty addition! I might try that when making garlicky mashers. YUM. If you have a love of Middle Eastern food and more leftovers than you can deal with… Here is a good easy and quick leftover meal. Throw all of that together wrapped or in a pita pocket and it is WONDERFUL.. Soothes the savage emotions! To start off with, preheat the oven to 450 degrees. While the oven is heating take your pita ,I use Toufayan Bakeries whole wheat pita, and cut one into bite size pieces. If it is the pocket kind separate the halves so you have pretty thin slices of pita. Put the pieces in the oven for 5-10 minutes until they are to your desired crispness! A few cloves of garlic… from 1-3 depending on your level of garlic love. Lemon juice. I used about a cup of it. The original recipe called for less… again depends on your level of lemon love! Olive oil to your taste, the less you use, the lighter in fat content the dressing will be. chopped tomatoes. I use campari. they are always super sweet and perfectly ripe. Toss all the veggies together with the dressing. DO NOT add the pita chips until you are ready to serve. They get all soggy and gross when they sit in the dressing. I also always end up adding feta cheese. What is salad without some good cheese? The sandwich is my mother’s chicken salad on an onion roll. 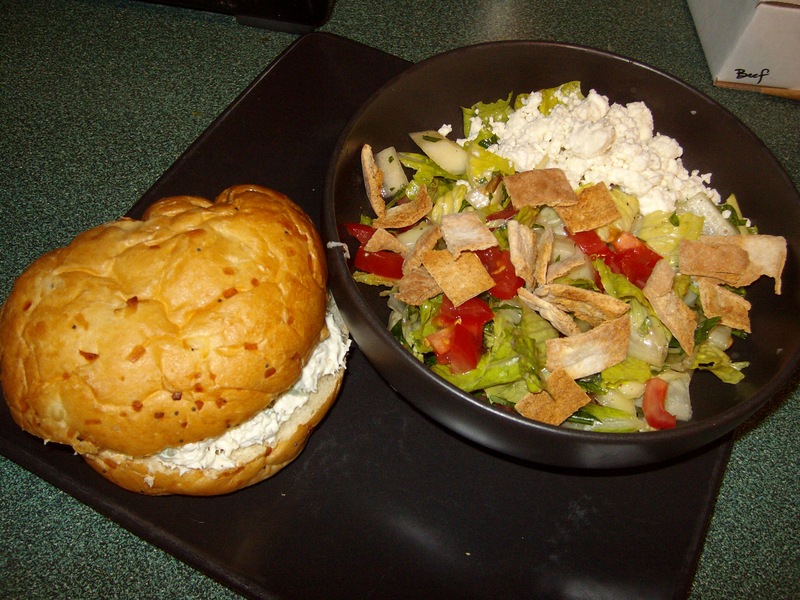 The fattoush was an amazing compliment to the creamy sandwich. I am not allowed to share mom’s recipe.. It is her secret! Well there ya go.. What would you do differently? Let me know if you make it! Dinner tonight turned out yummy! I had some leftover roast beef (a chuck roast to be specific) and made *french* dips out of it. To make the roast, google it… seriously… Personally I cooked mine in the crock pot this time. Heat up some olive oil in a big cast iron skillet and sear the roast on all sides… Then place in the crock pot for 7-8 hours with Beef broth, soy sauce, balsamic vinegar, and Worcestershire sauce… yes.. LOADED with sodium.. I LOVE sodium. Have that meal with some nice veggies put in the pot with the meat… potatoes and carrots.. green beans.. whatever you like with roast. Preheat the oven to 450. If you want the sammy’s on garlic bread… do it… whatever you like… do it… once oven is preheated, put the bread in and toast for a bit.. until it is just brown around the edges… probably about 10 min. While the bread is toasting, put together the marinated salad. 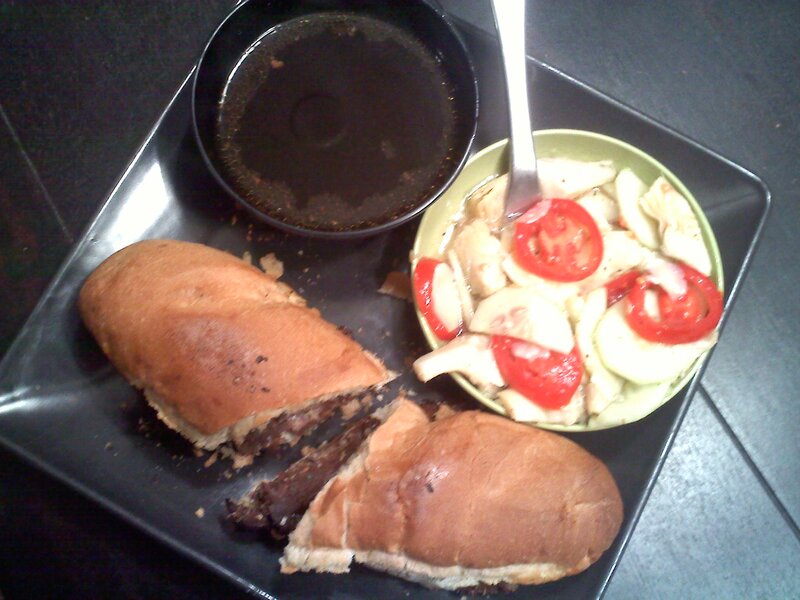 I use cucumber, marinated artichoke hearts and tomatoes with my favorite italian dressing. just slice, mix and chill… easy as that! serve everything up and enjoy… such an easy way to use leftover meat! a very “comfort food” meal… but not THAT unhealthy.. just the sodium content… whatever people… seriously.. enjoy your food!